Bengaluru: India’s antitrust regulator has approved Walmart’s $16-billion purchase of Flipkart, despite protests from traders across the country over fears that the deal would drive several small retailers out of business. On Wednesday evening, the Competition Commission of India (CCI) posted a tweet from its official Twitter handle, confirming it had approved the deal, without sharing any further details. Interestingly, CCI said Flipkart’s discounting practices might need to be dealt with separately, an issue that assumes significance in the wake of the new draft policy that proposes further restrictions on discounting by online marketplaces. India already bans discounting by online marketplaces. “The issues concerning FDI policy would need to be addressed in that policy space to ensure that online market platforms remain a true marketplace providing access to all retailers," CCI said in its order. CCI’s approval, which had been expected by Walmart and Flipkart sometime this month, paves the way for the companies to close the deal. On 9 May, Walmart agreed to pay $16 billion for a 77% stake in Flipkart, valuing India’s largest start-up at about $21 billion in what is one of the biggest acquisitions in the country. Walmart had sought approval for the deal on 19 May, days after it announced the proposed buyout of Flipkart. At the time, Walmart had said the deal did not create any competition concerns and that the pecking order of the broader retail market in India would remain unaffected by the deal. Walmart said on Wednesday that it welcomed CCI’s decision. “Our partnership with Flipkart is testament to our continued confidence in our ability to contribute to this market. Flipkart is a prominent player in India with a strong, entrepreneurial leadership team that is a good cultural fit with Walmart. We believe that the combination of Walmart’s global expertise and Flipkart will position us for long-term success and enable us to contribute to the economic growth," Walmart said in a statement. 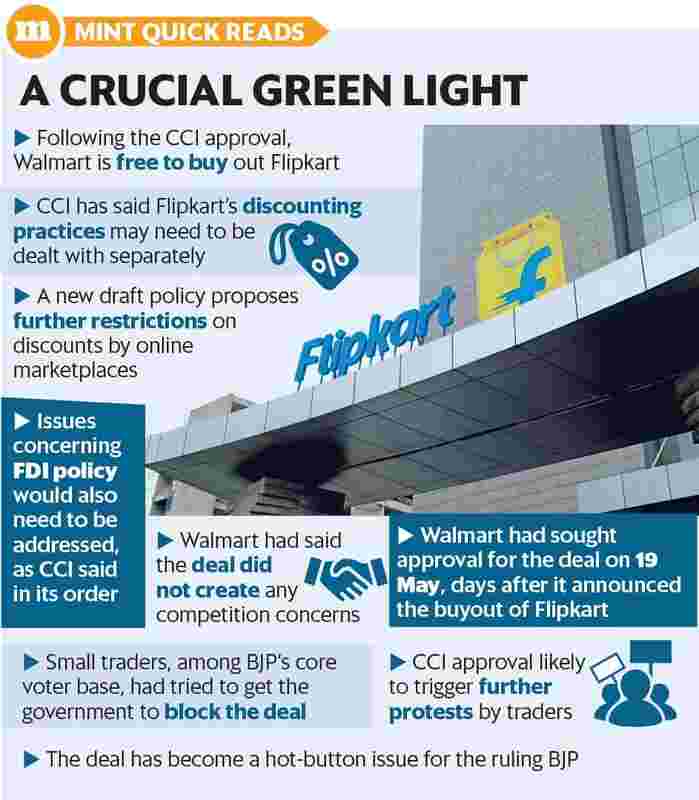 While experts had said there were no grounds for CCI to block Walmart’s buyout of Flipkart, it has become a hot-button issue for the Bharatiya Janata Party (BJP). Thousands of small traders, who are among the core voter base of BJP, had tried to get the government to block the Walmart deal. Praveen Khandelwal, secretary general of Confederation Of All India Traders, had said the traders’ body had sought an appointment with the commerce ministry to discuss the matter and push for the deal to be blocked. “We have been expecting the government to reject this deal, but so far, we haven’t heard from them... We will fight this deal tooth and nail, and, if necessary, take this matter to the Supreme Court," Khandelwal said in an interview in July. The approval from CCI may trigger further protests from traders across the country. On the business side, the deal will redraw the retail landscape in India as Walmart takes its battle in the US with arch-rival Amazon to the world’s fastest growing major economy. The buyout, which is Walmart’s biggest acquisition and the biggest e-commerce deal globally, marked the end of an era for Flipkart as co-founder and chairman Sachin Bansal left the company, selling his 5.5-6% stake for roughly $1 billion. Flipkart’s other founder, Binny Bansal, continues as Flipkart group chief executive officer (CEO) and Kalyan Krishnamurthy has retained his position as Flipkart CEO. Shrutika Verma in New Delhi contributed to this story.